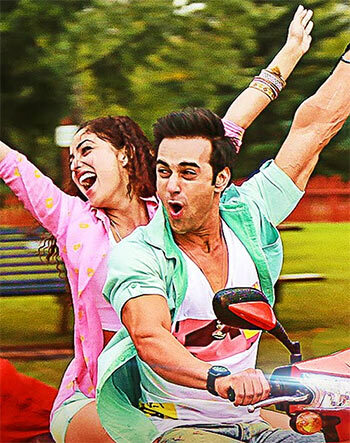 REVIEW: SANAM RE IS UTTERLY STUPID! Sanam Re is a moronic film, feels Sukanya Verma. It's one thing to indulge a restless tyke who's wrecked the bedroom walls with a box of crayons and regard his mess as masterpiece. But to witness an adult with zero flair for filmmaking land opportunities while genuine talent struggles to see the light of the day is as frustrating as it is mind-boggling. Sanam Re, director Divya Khosla Kumar’s moronic second film, produced by T-Series boss and better half, Bhushan Kumar is packaged like a postcard romance high on sweeping ballads and snow laden vistas. What it really is a series of shabby, senseless music videos sounding off monotonous melody that believes in love at first sight between preteens because grandpa forecasted so and paints romance as wooden actors caught in an endless snowstorm. Although the predominantly hill-station scenery of Sanam Re is set in present and flashbacks only as far as the 1980s, Himachal resembles an ornamental, overdone European village inhabited by people stuck in some sort of time warp. While the Kalpa bits hold true, part of its confused geography expects us to believe Canada’s majestic railway stations and Leh’s aquamarine lakes have miraculously shifted to HP. And so men in kilts launch into an unexpected parade outside Rishi Kapoor’s photo studio called Johnson & Johnson (who despite being neither, dresses up like one from the 1920s) along side his knee-high grandson who grows up to be Pulkit Samrat. Ostensibly, there are only two more kids in his fanciful neighbourhood -- they grow up to be Yami Gautam and Urvashi Rautela. As if one drab love story wasn’t tedious enough, Khosla Kumar concocts a phony triangle around a Canadian yoga camp where we are subjected to bizarre concepts (cuddle therapy) and inadvertently hilarious pickup lines (Jab tumhare haath mere haath mein aata hain toh mujhe pata nahi chalta kaunsa mera hai aur kaunsa tumhara). Worse, it offensively presumes that the audience will break into splits at its homophobic, racist gags or Manoj Joshi mispronouncing (and misquoting) Shakespeare. There’s also stand-up comedian Bharti Singh as a new-age lifestyle guru at the afore-mentioned camp mouthing humour so vile even her straight face can’t conceal. In this schizophrenic rubbish -- for it’s certainly not a script, hardly a synopsis -- landscapes change faster than its cast’s wardrobe and characters suddenly appear or mysteriously vanish at the director’s whim. Divya Khosla Kumar even shows up in front of the camera, early on in an item song, vacuously gazing in and out of a medium she’s clearly struck by but just doesn’t get.